The opportunity to experience the essence of Northern Italy's Lake District in a very personal and intimate way. 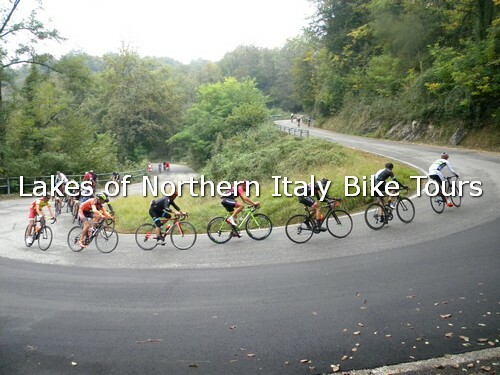 1) The most equipped and enjoyable road cycling area in Italy (1,600 km – 1,000 mi). 3) Its proximity to international Milan Malpensa Airport. An 1 hour and 15 minute ride with van support to Colmegna. 4) Easy access to eight lakes in the region. Narrow climbs, fast downhills. undulating and up and down roads across valleys, hills and lakes. 5) The opportunity to plan each day's ride to suit the guests in small groups (8/10 riders). A riding schedule that has you back to the hotel by mid-afternoon. 6) Remain in our two hotels for the entire tour, so you can get a blend of advantages of what the town of Varese and the Lake Maggiore have to offer. We are the hotel owners, the guides and the operators of our tours as well. 7) Daily laundry service for your clothing. 8) We love to ride by bike for fun without forgetting to enjoy what our area has to offer: age-old villas, parks, churches and hermitages which were built from Sixteenth Century to the Nineteenth Century, exibitions, history, art, culture. 9) The climbs aren't long, generally from 2 km to 10 km (from 1.2 mi to 6.2 mi), but you can tackle them one after the other in succession. 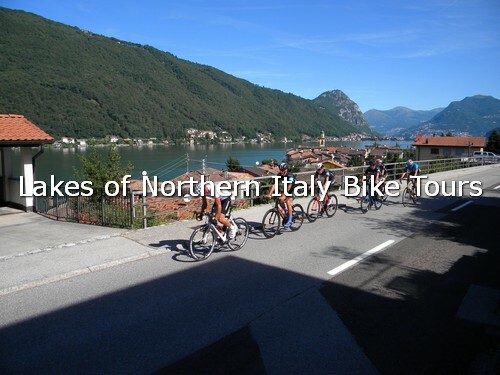 However, we planned itineraries where you can avoid cycling any big hills and medium sized hills as well.